Like The Slap, this novel begins with a BBQ held in the Australian suburbs (in Sydney this time) where a dramatic incident shatters the peace of the day and irrevocably fractures the relationships of those gathered. 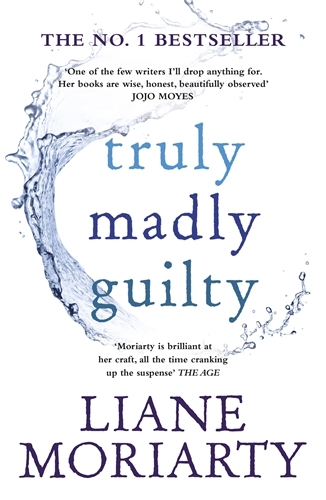 Truly Madly Guilty is a perceptive examination of friendships and partnerships; both old and new, male and female; and the joys and weighty responsibilities of parenthood. In true Liane Moriaty style, the characters are all well drawn and multi-layered; people you could recognise from your own life, doing their best to navigate modern pressures without inflicting or sustaining too much personal damage en route. Their personal dilemmas and aspirations are laid bare with a careful choice of words and imagery throughout the novel. There are some memorable scenes and words spoken, which resonate after reading. Compared to The Slap, the tone is less cynical and jaded and more forgiving to the protagonists’ foibles and cruelties. The players range across the board from accountants, strippers and concert musicians; and that’s just the female cast. Sometimes unfairly lumped in the ‘chick lit’ category, I had not read Moriarty before this, but have been impressed enough to want to read more of her half a dozen other published titles.